The textbook that taught the Faith to millions of Catholics worldwide. Almost 500,000 copies of this classic high school text were printed, which was used to teach the Faith to generations of English-speaking Catholics around the world for more than four decades. Its outstanding clarity, persuasiveness and comprehensiveness are totally unique. No popular textbook in English published since it was last published in 1962 has repeated Sheehan's successful presentation of the Faith. The structure and sequence of the argument of Sheehan's Apologetics have a unique clarity and logical force. The exposition of the deposit of faith in Catholic Doctrine is clear and thorough. Objections are faced openly and honestly. Dr Sheehan's whole text breathes a loving confidence in the truth of the Faith founded on Him to Whom all honour and glory is due: Jesus Christ, the same, yesterday, today and forever. Michael Sheehan was born 17th December 1870 at Newtown, Waterford City, County Waterford, Ireland. His father, born and bred in Newmarket, County Cork, owned an export business. His mother was an Anglican, the daughter of a Church of Ireland minister. Mr and Mrs Sheehan had ten children, of whom Michael was the sixth. In 1880, the family went to reside in Dungarvan, County Waterford, in a two-storey house in Mitchell Street. Michael was educated privately, then for 1� years at the Christian Brothers. Next he spent nearly four years at the Augustinian School, Dungarvan; then three semesters (1� years) at the seminary of St John�s College, Waterford. In 1890 he was transferred to the seminary of St Patrick�s College, Maynooth, where in addition to the usual philosophy, theology, Latin and Greek, he studied Irish, English, Italian and French. Having brilliantly completed the full course there in 2� years before he was 23, he was appointed lecturer at St John�s College, Waterford, in 1894, and continued to study theology privately, pending canonical age for ordination. He was ordained a priest in 1895, obtained an M.A. from the Royal University of Ireland the same year, and taught liberal arts at St John�s for two years. In 1897 he obtained an M.A. in Classics from Oxford University. That year he was appointed to the Chair of Ancient Classics in Maynooth. Later he studied at German universities: one semester at Greifswald, studying Latin, Greek and Sanskrit; and three semesters at Bonn, gaining his Ph.D. in Classics there in 1901 with his thesis, written in Latin (not unusual for the time), on the Athenian orator Isocrates. Dr Sheehan was Commissioner of Intermediate Education for Ireland 1906-1922. He was Professor of Greek at Maynooth College 1905-1922, and its Vice-President 1919-1922. On 22nd February 1922 he was named titular archbishop of Germia when appointed Co-adjutor Archbishop of Sydney, Australia. He was consecrated on 28th May. In August, on his way to Australia, he stopped off at Rome, staying at the Irish College. He had an audience with Pope Pius XI, in which they spoke German. Retiring to Ireland, Archbishop Sheehan lived in Dublin, at the Holy Ghost Fathers, but he often visited Ring, County Waterford (four miles from Dungarvan), where he once used to spend his holidays among the fishing folk there. It was in Ring that he had first learnt Irish from an aged woman, and in 1906 had co-founded an Irish College, which is still thriving today. Although he had not spoken Irish in his childhood, he became proficient in it and wrote six works in Irish, including studies of the language. Dr Sheehan wrote two other books of religious instruction, A Child�s Book of Religion (1934), and A Simple Course of Religion (1937). He had a great interest also in plant-lore and botany and co-authored a book on that subject in Irish. His scholarship, clear mind and wonderful expression are exemplified in Apologetics and Catholic Doctrine. Archbishop Sheehan died 1st March 1945 at St Mary�s, Talbot Lodge, Blackrock, Dublin, and is buried outside the entrance to St Nicholas� church in Ring. Apologetics and Catholic Doctrine, printed originally as two volumes (and later within one cover) by M.H. Gill & Son, Dublin, was a classic high school text in several countries over forty years, and sold well over 450,000 copies. It was sub-titled, �A Course of Religious Instruction for Schools and Colleges.� Because of its outstanding clarity, persuasiveness and comprehensiveness, I have long desired to see the book reprinted�but of course this could not be done without some revision of the text. My principle has been to retain the original text where possible and to add, change or delete only where necessary. Additions, totalling nearly 200 pages, come from documents of the Magisterium and works of modern authors. Other additions expand the treatment of some subjects, deal briefly with modern questions, and broaden material from the Bible, the Fathers, the liturgy, canon law, arch�ology and Eastern Churches. Parts of the chapter on Marriage have been re-written substantially. Two chapters are entirely new: one on the Bible (save its last section); one on the Church. Tables and diagrams have been inserted in the text. A few parts have been re-ordered. The Scripture quotations and references are changed from the Douay-Rheims translation to the Revised Standard Version. The Denzinger references are updated to the 36th edition, edited by A. Sch�nmetzer S.J., 1965. These numbers are unchanged in the 37th edition, Denzinger-H�nermann, 1991. All of the lengthy footnotes have been transferred to the main text, to help ease in reading. Dr Sheehan�s classical English style has been modified in some places. The many disciplinary, canonical and liturgical changes since the second Vatican Council have been incorporated. The natural sciences have also been updated. This edition draws upon some of the revisions of Fr Bernard Kelly C.S.Sp., who issued a revised edition of the two volumes in 1962. Deleted from the text are a few passages judged too technical or too subtle, some things no longer applicable, and a great deal of the former scientific references and arguments. Deleted from the footnotes are most but not all of the references to Latin manuals, French and German works, and lesser known books long out-of-print. Nine-tenths of Archbishop Sheehan�s two-part work remain here exactly as he wrote it. As in the original, the text in large type gives a complete but basic treatment of the subject matter�whilst the text in this smaller print is for the more advanced reader. Translations of the Roman Liturgy have been done afresh from the Latin; no use has been made of the ICEL versions. Excerpts from the Catechism of the Catholic Church are translated from the definitive Latin text promulgated in 1997. The two Parts of this book stand together, but either Part can be read first. Part II, Catholic Doctrine, covers the same material as Parts 1 and 2 of the Catechism, namely the Creed and Sacraments. It does not cover in any detail the Commandments and Prayer. Those who desire to learn the moral teaching of the Church should read Part 3 of the Catechism, which gives a complete presentation. In preparing this new edition, I have received assistance from many people. Before all, I thank the Irish Provincial of the Holy Ghost Fathers for his permission to revise and reprint the text. I also wish to thank Mrs Leanne Nugent, Mr Simon Paton and Mr Phillip Pavich for their generous help in the preparation of this revised edition. I am grateful also to many friends and colleagues who have helped me correct or refine the drafts with the aid of their expertise in the various fields of history, theology and science. The motivation for our work was the propagation of the faith and, in accordance with this, any personal profits from this book will go to Catholic Missions and aid to refugees. Mr Gregory Byrnes of New South Wales generously supplied, from his personal research, some of the details and dates of Dr Sheehan�s life, thereby preventing a repetition of mistakes which have appeared in other biographical notices. From today�s viewpoint it seems remarkable that this book was once a school text for 15 and 16 year olds. For many, it gave the support and knowledge to sustain them in the Faith for a lifetime. They knew the Catholic Religion, and they knew the reasons for it. Both teachers and students who used it have testified to its lasting impression upon them. I hope that its re-issuing will help to restore to today�s disinherited young generation their rightful heritage. 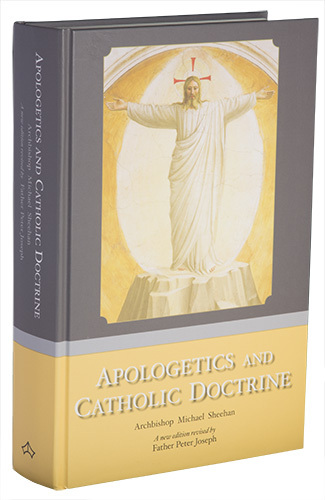 The structure and sequence of the argument of Sheehan�s Apologetics have a unique clarity and logical force. The exposition of the deposit of faith in Catholic Doctrine is clear and thorough. Objections are faced openly and honestly. Dr Sheehan�s whole text breathes a loving confidence in the truth of the Faith founded on Him to Whom all honour and glory is due: Jesus Christ, the same, yesterday, today and forever.